Originally a “staging inn” with one straw bed over a shipping office, Hotel Ullensvang is rooted with deep Norwegian history and traditions. This hotel has been run by five generations of the Utne family after Hans Utne built the inn in 1846. A cabin in Lofthus near the inn was the inspiration and birthplace of the musical creations by the famous Norwegian composer Edvard Grieg. Little by little, the hotel was expanded and restored to the luxury hotel that it stands today. 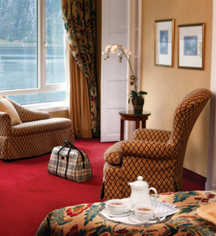 Hotel Ullensvang offers over 200 guestrooms with magnificent views of the Hardanger mountain range and Fjord. The natural wonders of Hardanger make Lofthus a convenient location for guests seeking a unique outdoor and private experience. 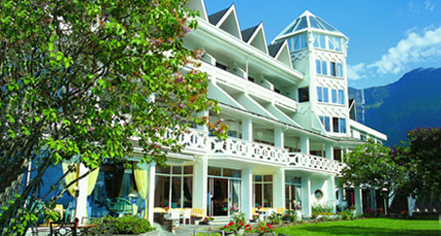 Hotel Ullensvang, a charter member of Historic Hotels Worldwide since 2011, dates back to 1846. During World War II, the hotel was temporarily used as a retirement home for Bergen residents. Pet Policy: Service animals allowed: Please contact hotel. Pets allowed: No. Hotel will recommend kennel. Originally a “staging inn” with one straw bed over a shipping office, Hotel Ullensvang is rooted with deep Norwegian history and traditions. This hotel has been run by five generations of the Utne family after Hans Utne built the inn in 1846. Learn more about the History of Hotel Ullensvang .